Fixture: A fixture is the titanium screw like cylinder placed into bone and acts as an anchor for a crown to replace one or more missing teeth. Implant fixtures have similar shapes to natural tooth roots. 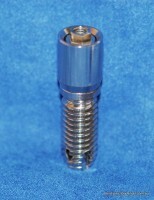 The fixture usually has a thread to help the implant screw into the bone and to increase the surface area for the implant to fuse (integrate) with the bone. An implant may take between three to six months to fuse to bone. In selected cases an immediate implant may be considered. An immediate implant is when an implant is placed directly into the extraction site at the same time as when the tooth is removed. The top of the fixture has a space to connect with a section that passes through the gum. Abutment: The abutment is the part that passes through the gum into the mouth and is bolted onto the fixture. 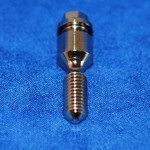 Implant manufacturers utilise a wide range of shapes, connecting mechanisms and abutment screws to bolt the abutment down onto the implant fixture. The restoration, prosthesis or superstructure is the part that sits above the gum on one or more abutments to restore the space caused by lost teeth. This part can be cemented or screwed onto the abutment. The prosthesis may be either a single tooth, multiple teeth or a denture held in place by implants. 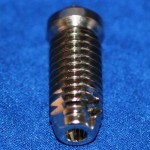 There are many different implant companies producing implants and their components are often not interchangeable. There is a tremendous variation in shapes, size, materials and implant fixture surface textures. Missing teeth can be replaced without affecting other teeth. The final restoration is firmly secured to bone. Implant crowns, bridges and hybrid dentures can not removed by the patient but can be removed by the dentist if required. Cleaning, biting pressure as well as the appearance and feel of the restoration is more like natural teeth. The pressure exerted by the implants into the jaw bone through normal chewing stops bone and gum shrinkage. Loss of an implant is a rare complication but can unfortunately happen. 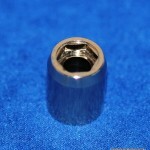 More common complications are loose screws or crowns that are usually easily re-tightened. Chipping of the porcelain crown on an implant may occur. ‘Screw on’ implant restorations are more easily repairable as the restoration can be disassembled. ‘Cement on’ implant crown are usually cemented onto the abutment using a semi-permanent cement for the same purpose. Gum disease can occur around implants and good oral hygiene has to be maintained as with natural teeth. It is important that patients with implants attend regular six monthly check ups and cleans. Implants greater than 10mm and wider than 4mm have a higher success rate. The height, quality and bulk of bone varies between individuals and even within the same individual depending on location. Implants can only be placed if there is adequate bulk of jaw bone and can not be placed if there is not enough bone. It may be possible to increase the bulk of bone using grafting procedures which vary from very simple techniques at time of implant placement for simple bone grafting to complex procedures requiring multiple procedures for large bone grafts. An individual’s general health, illnesses, medications and smoking may affect healing. A patient’s commitment to good oral hygiene and routine dental care is critical to long term success. Patient expectations: Some complex cases have aesthetic and functional limitations which may not be realistically attainable. Assessing suitability:Patient assessment is very important and involves a thorough medical hystory, dental examination, photos, X-rays, possible surgical and radiographic guides for X-rays, impressions for study models and bite registration records. Good oral health: The mouth needs to be free of gum disease, free of decay and any infections from adjacent teeth near the implant site as poor oral health will adversely affect implant success. 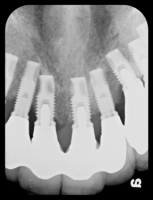 Treatment Plan: There is a large variation in implant treatment options in complex cases. The same full arch may be restored using either two implants holding an overlay denture or 8-10 implants with individual crowns. The complexity, patient commitment and costs vary depending on the plan. Smoking: Although smoking does not disqualify you from having implants, smokers have a higher rate of complications and failures. Its best to stop smoking before embarking on implants. Once all records have been taken and studied, a number of treatment plans are discussed varying in complexity, patient commitment and costs. Very complex cases may require consultations with specialists. The follow up appointment is very important as the costs, limitations, advantages and disadvantages of the various treatment options are explained in detail.